A super is a wooden box that is part of a Langstroth style beehive. These supers are compartments that are stacked on top of each other in the hive and can be added at times and removed when they aren’t needed. The two functions of supers are the collection of honey and for use as brood boxes, the place where baby bees develop. The supers have either eight or ten frames per super. This corresponds to the style of the beehive boxes in the entire hive. Little Giant & Ag, a company that sells a wide range of products for the beekeeping industry, has the Little Giant Farm & Ag MEDBOX10 Honey Super Hive Frame in its product line. What Is the Little Giant Farm & Ag MEDBOX10 Honey Super Hive Frame? The Little Giant Farm & Ag MEDBOX10 Honey Super Hive Frame is a medium ten frame honey super. Actually, this super can be used either as a honey super or as a brood super. Medium supers are becoming the most common in hives. They have a depth of 6 5/8 inches and the length and width dimensions match those of the hive box. The medium supers are easier to handle and move when they are filled with honey. The purpose of the super is to add more room to the beehive. Honey supers may be added to the hive during the peak season for honey production and then later removed when production slows down. Adding supers expands the capacity of the beehive and is a way to increase the number of bees in a colony. Brood supers provide space for the developmental stages from eggs to baby bees. More brood supers mean more space for young bees to develop. More bees mean more honey, and more honey requires more supers at harvest times. The Little Giant Farm & Ag MEDBOX10 Honey Super Hive Frame is made of unfinished pine, ready to be finished to match the rest of the hive boxes in the apiary. It should be painted or otherwise protected from the elements. The box joints are stapled and sometimes split the wood. Some users reinforce the joints with glue. This model is a 10-frame medium size super box and will fit in a standard size Langstroth hive. This super is 6 5/8 inches deep and 20 inches long by 17 inches deep. The supers we are comparing with the Little Giant Farm & Ag MEDBOX10 Honey Super Hive Frame range from around $$ to around $$. They are available through Amazon.com. At around $$, the Little Giant super is the lowest priced of the four supers. This super is 6 5/8 inches deep and 20 inches long by 17 inches deep. We picked three other supers available on the market to see how they compare with the Little Giant Farm & Ag MEDBOX10 Honey Super Hive Frame. Two are 10-frame supers and one is an eight frame super. It is easy to use this super. It does need finishing to be weatherproof and is ready to be inserted into the hive. It comes with 10 frames that are pre-installed, and wax-coated with a natural-colored plastic foundation especially good for harvesting honey. The frames are 6 1/4 inches. The Little Giant Farm & Ag MEDBOX10 Honey Super Hive Frame comes assembled and ready to paint. This super has interlocking joints for strong construction. The joints are fastened with staples which sometimes split the wood. Some people complain about knots in the pine, but these are covered once the super is painted. The Little Giant & Ag company has good online and phone support and stands behind their products. ​Once it is assembled and finished, it is ready to install in a Langstroth style hive. ​The hive super is easy to assemble. It has pre-cut, dovetail joints and includes heavy duty nails. Users report using a rubber mallet to pound in the nails and some have used glue for extra reinforcement. Pieces are sometimes missing, but beekeepers are resourceful and several mentioned making the pieces they needed to get the super ready to go rather than contacting the manufacturer. ​The foundation is built with premium fir wood while the frames are made of white pine wood. This super weighs just over eight pounds and the Little Giant & Ag super weighs just over 11 pounds, even though the Honey Keeper is a larger model with larger frames. It comes with 10 deep frames and 10 pre-cut frame foundations with unwaxed hexagonal shaped foundations surfaces. The super’s dimensions are 16 1/4 inches long by 20 inches wide by 9 3/4 inches high. There is no printed warranty on this unit, but the end users are positive about their dealings with the company. COMPATIBILITY - Fits a 10-frame standard Langstroth bee hive as a helpful addition to your beekeeping needs. 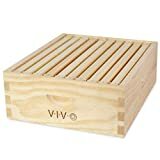 The VIVO Beekeeping Add-on Medium Super Beehive Box Kit is a good tool to expand the capacity of your hive and organize it efficiently. This super can function either as a brood super or a honey super. This is a kit that comes ready to be assembled with the necessary hardware. It has interlocking joints for extra strength. it is assembled, it has an attractive natural appearance. Painting or finishing the super with a weatherproof product is still recommended. It comes with 10 medium frames and will fit in a 10-frame Langstroth style beehive. ​Because it needs to be assembled, this super isn’t ready to place into service when it arrives. Once it’s ready, it is easy to put in place in the hive. ​The natural look of this super is attractive, but it should be finished to weatherproof it. Usually, this means matching the finish to the rest of the hive. The joints are interlocking to provide maximum strength and durability.. The company is committed to providing quality products that are affordable for the beekeeper. Their customer service is good. This 8-Frame Assembled Honey Super Kit is manufactured by Mann Lake, an employee-owned Minnesota company that specializes in the manufacture of beekeeping equipment. This super is made with quality pine and comes completely assembled. This kit includes the assembled super and eight 6 1/2″ assembled wood frames that come with a yellow Rite-cell foundation coated in beeswax. The dimensions of the super are 19 7/8 inches long by 14 inches wide by 6 5/8 inches depth. With eight medium frames, it is slightly smaller than the other supers. ​Since this super arrives fully assembled, it is easy to get it finished and put it to use in the hive. ​This super comes fully assembled but needs to be painted or finished with a weatherproof product. 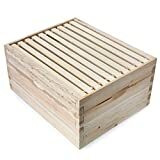 The raw wood hive boxes and supers are attractive looking, but protection from weather is important to prevent warping and other problems with the wood that would affect the bees. ​Users are complimentary about the quality of construction. This super comes assembled and the joints are stapled for reinforcement. There is no mention of warranty on either Amazon or on the Mann Lake website, but the emphasis on customer service is a good indication that this company will try to rectify mistakes and respond to questions and complaints. The super is a unique element in the structure of the beehive that expands the capacity of the hive either for either brooding or honey collection. Supers can be inserted into the structure of the hive as the season dictates and then can be removed when honey production slows down. Choosing a super depends on factors other than the super itself. This box gets inserted into an existing beehive structure. Continuing to purchase equipment made by the same company assures a consistency in the hive. Other products will work, but a case can be made for sticking with the familiar unless the beekeeper has issues with the hive’s manufacturer and is looking for a change. The two 8-frame supers in this comparison both come already assembled, which is something that might move them to the top of the class. That is definitely a time saver. However, one issue that a number of reviewers mention is missing or broken pieces. That wouldn’t be a problem with an assembled model. We give the Little Giant Farm & Ag MEDBOX10 Honey Super Hive Frame 4 stars on a 5-star rating system. This is a fairly simple product that performs an important function in the hive. This model comes assembled at a price point about 30% less than the other 8-frame kit and the two 10-frame kits. Both are good reasons to choose the Little Giant Farm & Ag MEDBOX10 Honey Super Hive Frame.